Cover the court with greater skill by mastering the essentials of the game. 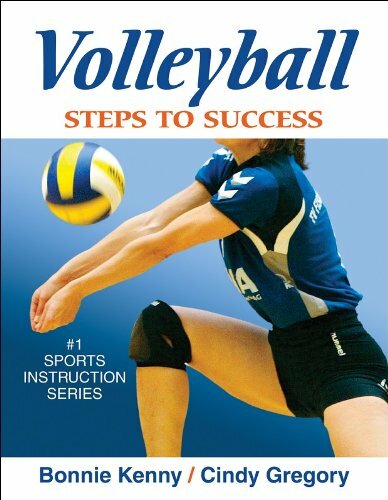 Volleyball: Steps to Success offers a comprehensive, progressive system for learning that includes expert instruction, crisp illustrations, and 60 drills to improve play on each side of the net. Volleyball: Steps to Success establishes complete fundamentals by helping you master proper footwork and posture. The lessons then move forward through the individual skills of serving, passing, setting, attacking, blocking, and digging. Also highlighted are recent changes in the game, including the addition of the libero position and rally scoring. The expertly selected drills and step-by-step instruction can help you speed the development process. T he best volleyball players and coaches use the optimum volleyball drills in practice to bring their game to the next level. To elevate your individual or team’s volleyball to its highest potential, you must do the same. In order to master the many important aspects of the game you must employ the repetition of highly specific drills to develop improved skills. If you are seeking to improve your abilities in passing, serving, setting, blocking, digging, service reception or spiking, here is the volleyball training program that can help you make the difference. What better way to improve your volleyball program, than to turn to an All Star Coach who already has the experience in doing just that. Bob Bertucci has over 20 years of head coaching experience and has established a reputation as one of the nations’ top volleyball coaches. He currently is coach of the Temple University where they recently finished 29-7 and a NCAA sweet 16 finish. Described as an architect of the game, he has coached several national teams, most recently the Women’s Volleyball Team in the World University Games in Spain. This video presents a detailed overview of six essential volleyball skills. A partial list of topics includes serving, setting, underhand passing, spiking, blocking, and digging. Length 61 minutes. A coach-friendly collection of drills designed to help develop setting and spiking skills and techniques. Length 40 minutes. This video presents a detailed overview of this essential aspect of play. Topics covered include posture, forearm contact, angle of platform, movement, drills, and coaching points. A series of developmental drills designed to enhance blocking and digging skills and techniques. Length 40 minutes. The Bertucci series of volleyball drills and practice can help you and your team enhance the area of the game that you want to improve.